I have been running TTTT on the North Shore since 1996, when I began teaching private swimming lessons in local backyard pools for friends and neighbours whilst still at University.Immediately, I found that the results achieved in the home environment were significantly better than I had seen elsewhere, and I was really enjoying teaching private swimming lessons to kids in this setting. Word spread about my service and when I finished university I spent a season teaching swimming full time in home pools. I spent some time travelling the world, did a stint in the corporate world of sports management for a few years, with Tadpoles moving along on the side during this time. However, my heart remained in swimming, and in 2002 I returned to focus all my energies on TTTT and offering private swimming lessons. 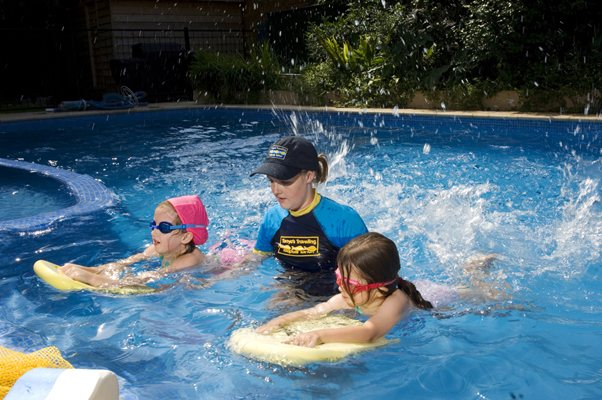 I am an Austswim accredited Swimming Instructor and an accredited Bronze Level Swimming Coach. In 1997 I completed a BA in Human Movement Studies at the University of Technology, Sydney, majoring in kinesiology. Over 20 years experience as a swimming instructor in a commercial swim school and privately and have given me the opportunity to develop unique TTTT teaching strategies designed for teaching private swimming lessons in the home pool environment. The Tadpole Instructors are a great team of fun, enthusiastic and motivated individuals. All instructors are Austswim qualified and hold resuscitation certificates. They have also all been trained in “Tadpole Tuition” for teaching private swimming lessons to small groups in the home environment.